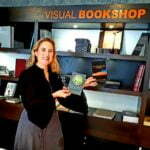 The Visual Gallery in Carlow has a book shop. Did you know that? My own books are there too, amongst a fine selection of books on topics of art, local history, culture. Look out for Seven C’s to Calm – Reclaiming your Anxiety-free Self (Well-being) and The Whisperings of Nature (poetry). The Visual Gallery is home to contemporary art and the George Bernard Shaw Theatre, where you can have a beverage in its bar or enjoy a fine meal or a cup of coffee next door in Lennon’s restaurant cafe. The Visual Gallery building is the design of Terry Pawson, a British architect with expertise in designing buildings for the arts and cultural sectors. It is reported to be Ireland’s largest gallery space, 3130m² in total, comprising four principle gallery spaces. The arts centre was opened in 2009. It houses a 335-seat theatre and the largest white-cube gallery space in the country – a massive 12 metres high – providing for high-quality national and international contemporary art, plus a host of performances and events in multiple disciplines, including theatre, dance, film, comedy, literature and music. The next time you are visiting Carlow, take some time to visit the gallery and check out the book store next to the reception area. Tranquillity, harmony and a restored connection with nature all in one little book of poems! 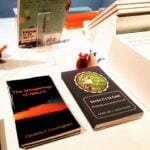 ‘The Whisperings of Nature’ is a wonderful and inspiring little poetry book written by Caroline Cunningham. This is Caroline’s first published book of poetry and it represents her journey in discovering her authentic self and her reconnection with nature which transcends beautifully through her written work.